- What's new? Sit down. What do you want to drink? - How many messages did you send me about tipping the waiter? - It was my mistake. Last time we were here I didn't leave a tip for Paul. It wasn't his fault. - I was here too, don't you remember? You left a small tip. - The restaurant was busy. The waiters are not professional, they all have other lives. It wasn't his fault. - Write a book about it why don't you. - You think I'm crazy? - You sent obscene emails to your professors, got yourself thrown out of UCLA for no apparent reason. Tell me again why you did it. Do you even know? Were you drunk? - But still, even drunk you must have known what was going to happen, that they'd throw you out. You don't remember? - They've already got you seeing a psychologist from Student Health, right? Why not claim mental illness, get your suspension removed? - Do they give Ph.Ds to the mentally ill? - Sure. Temporarily insane. You're going through a bad period in your life. Understand how psychologists think. All you have to do is admit the problem is you, not the world. You were temporarily insane when you wrote the emails. Going through a bad period in your life. A momentary aberration. - I wrote my professors again the next day. - You suffered from deep frustration. Once wasn't enough. You were getting it all out of your system. You did the same with the cult, right, the week before. Why? - Did I have anything to do with meeting me? We met around that time. - You don't know a lot. Ok. This is your story: Back East, you were in a Sufi cult. You were a student of Arabic Studies, somehow you fell in with these people. How many of them were there? - What attracted you in the first place to Islam? You're of protestant stock, correct? - I thought it was a masculine, powerful religion, unlike Christianity. - You believed some of that masculine power would rub off on you after you joined the cult. - I don't know. Never was sure. Finally I realized the leader was power mad, everything was a lie. I broke away. If I do write a book its first line will be, 'Becoming a drunk saved me from becoming a Muslim'. - Why did you break away now, after so many years? - It was the biggest mistake of my life coming to Los Angeles. What is here? Everyone back east tried to warn me. Are you listening to me? What are you watching? - A movie on YouTube. I think if I was growing up now I'd be diagnosed as autistic. I've decided that's the mental illness you have to claim to suffer from. I was just reading about it in The London Review of Books. The article mentioned the preference the autistic had for text messages over person to person contact and I immediately thought of you and your penchant for insulting messages. Autism was first defined as a mental condition of personal detachment, of being unable to love. Lacking love, sufferers from autism fall back on private rituals. They get violent when their rituals are interrupted. According to the article the condition of being unable to love has steadily became more common, and the designation has been extended to include people who can't stand people but who can stand dealing with others professionally. Asperger's is the name given to the most highly functional autism. Not being able to love makes you better as some jobs, it seems. Outside of the requirements of professional conduct, the Asperger's try not to look at people at all, for they might not like what they see. They may see that the idea they have of themselves they've made the basis of private rituals is being challenged by others, and then they'll go crazy. What do you think? - Of course it is. But you can tell the psychologist you're a highly functional Asperger's. She'll be impressed. - Ok. I'm an Asperger's guy. What about you? How were you autistic? - Who said I was autistic? I said if I had the misfortune to grow up now I might have been called autistic. I turned my back on the world, like autistic do. But unlike them, it wasn't because I feared the world wouldn't accept the place I'd made for myself, my image and role. Rather I had to protect myself from my anger at the destructive roles people around me gave themselves. - Can't I claim that I'm the same? - Not if you want to be let back in. Didn't the cult ever make you confess? You have to say your extreme behavior is your problem, not theirs, the normal people of the world. You're the world's victim, not its critic. Your anger was the result of your need for stability, had nothing to do with their the good people of the world's failure to deserve your respect. - Did you ever stop judging the world? - I've found once in a while people I could stand looking at. - I don't believe in love. I just want to be left alone. - Keep that bit of autism for the psychologist. Here, I want you to watch this scene at beginning of the movie Breakfast at Tiffany's. 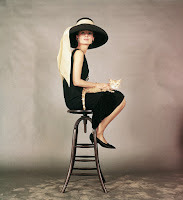 Party girl Holly Golightly, played by Audrey Hepburn, holds her cat and talks to her new apartment house neighbor. Poor old cat, poor slob, poor slob without a name. The way I look at it I don't have the right to give him one. We don't belong to each other. We just took up by the river one day. I don't even want to own anything until I can find a place where me and things go together. I'm not sure where that is but I know what it's like. Its like Tiffany's. / Tiffany's, you mean the jewelry story? / That's right. I'm crazy about Tiffany's. Listen, you know those days when you get the mean reds? / The mean reds. You mean like the blues? / No. The blues are because you are getting fat and maybe its been raining too long. You are just sad, that's all. The mean reds are horrible. Suddenly you are afraid and you don't know what you are afraid of. Did you ever get that feeling? / Sure. / When I get it the only thing that does any good is to jump in a cab and go to Tiffany's. Calms me down right away. The quietness and the proud look of it. Nothing very bad could happen to you there. If I could find a real-life place that made me feel like Tiffany's then - then I'd buy some furniture and give the cat a name. - I don't like movies. People don't belong to people. I'm not going to let anyone put me in a cage. I'm like cat here. We're a couple of no name slobs. We belong to nobody, and nobody belongs to us, we don't even belong to each other. Friend makes a pompous speech, somewhat in my style, warns her she's in the cage of herself, the cage of not loving. Holly orders the driver to stop the cab they're travelling in. She puts out the cat and orders the driver to drive on. The friend orders the driver to stop, gets out and begins calling for the cat. Holly sits and thinks. She decides she needs the cat, like you need your school. She gets out, finds cat who still doesn't have a name, but she also reunites with friend, who does. They kiss and the movie ends.